Make only one payment to buy Account Credit by going through the Payment Gateway and/or PayPal and then use that money to quickly make multiple purchases or ‘multiple items per purchase’ in your DoorVaani account. For example you can convert your money in your Account Credit into talk-time balance on one or more of your VOIP Lines even in amounts smaller than those allowed by the Payment Gateway or PayPal. Buy Account Credit and then distribute that amount as talk-time balance on your VOIP Lines in any proportion as per your needs. Money in your Account Credit is used by the system to do the optional “Auto Top-up of talk-time balances” of your VOIP Lines if set by you. Money in your Account Credit is used by the system to do the optional “Auto renewal of your DID Phone Numbers” if set by you. 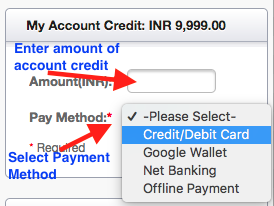 If you make offline payment to us, such as direct deposits of money directly into our bank accounts or make cheque payments etc., then such amounts received by us will be put in your DoorVaani Account Credit so that you can use it by selecting “Payment Method” as “Account Credit” while checking out your shopping cart. If any refunds are due to you from us for any reason, then you can opt to have those refund amounts put in your DoorVaani account. If not already logged in, please login into your DoorVaani account. 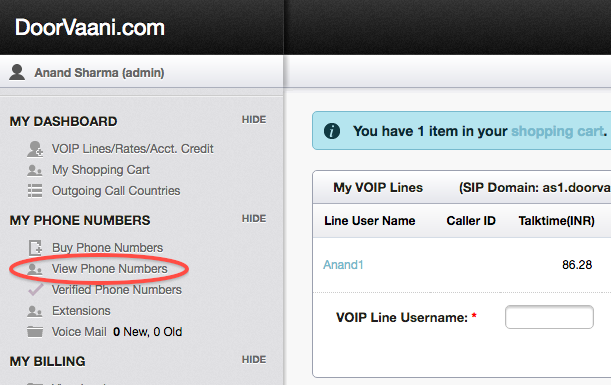 Please click on “VOIP Lines/Rates/Acct. Credit” menu on the left hand side as shown in the image below. You will then see the Account Credit box on the right hand top corner. Please enter the Account Credit amount you want to buy and then select your payment method as shown in the image below. Please click on “Buy Credit” button to go to the Payment Gateway or PayPal page. Please complete your purchase through the Payment Gateway or PayPal. When you return back you will see the amount you purchased is added to your Account Credit.